Race around the Mushroom Kingdom, now with two characters to a Kart. One character races, while the other uses items, and they can switch places at any time. 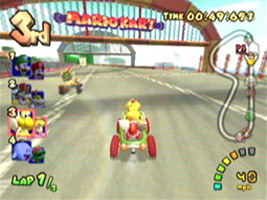 Your characters are limited to the car they can ride based on their size, and each character also has their own special attack. Race laps around each circuit and pass the finish line to earn points. The player with the most points at the end of all the circuits wins the Cup. Collect items to attack your opponents or to gain extra speed. Win cups in Grand Prix, aim for the best time in Time Trial, race your friends in VS. Mode or battle them in three multiplayer modes: Balloon Battle, Shine Thief and Bob-omb Blast. 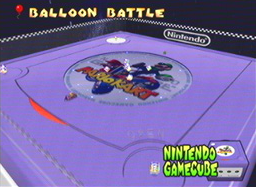 One of the Battle Mode stages is set on top of a giant GameCube. The central disk has been replaced with a Mario Kart: Double Dash!! graphic. 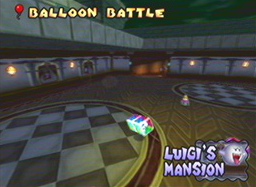 One of the Battle Mode stages is set inside Luigi's Mansion. The main part of the stage seems to be set in the ballroom, and ghost portraits adorn the walls. 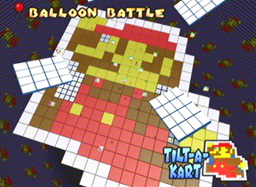 This secret Battle Mode stage is set on a giant 8-bit Mario sprite from Super Mario Bros. The background music uses the first few notes of the Super Mario Bros. theme when it starts. On the Mushroom Bridge and Mushroom City levels there are cars, trucks and other vehicles you have to avoid. These vehicles contain some easy-to-miss cameos. The side of the postal truck includes 8-bit sprites of the P-Wing and an envelope from Super Mario Bros. 3 on the side. The truck's license plate reads "SMB3". 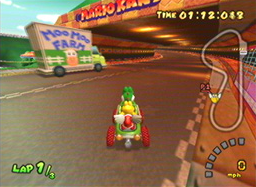 The side of the milk truck has a picture of a cow on, and the words "Moo Moo Farm", the name of the second track in Mario Kart 64. The truck's license plate reads "1UP". 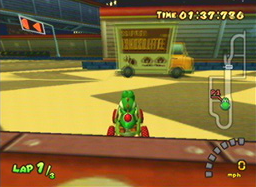 The side of the chocolate truck has the words "Super Chocolate" written in the style of the Super Mario Bros. title, plus chocolate-colored sprites of Mario, Goombas and Koopa Troopas on the side. The truck's license plate reads "W1-1" (short-hand for World 1-1: the first level of the first world, used in many Mario games). The car number plates all read "POW", which was an item originally used in Mario Bros. The blue buses have "STR" number plates, short for Star, an item used throughout the Mario series. The red buses have "SUN" number plates, short for Super Mario Sunshine. 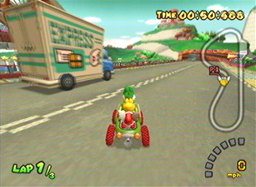 On the Dry Dry Desert track, one of the billboards features the logo for Super Mario Kart.